Negative revisions of 2017 EPS at WFC will continue as analysts re-assess the embedded assumptions for operating and capital leverage. In particular, with no further scope for balance-sheet optimization, risk-weighted assets will grow more in-line with loans than over the last few years and limit the annual net payout ratio to 60% or less (versus the guidance range of 50-65%) by offsetting the benefit that arises as no further deleveraging is needed. As a result, we see the capital leverage implicit in 2017 estimates for a 2%+ reduction in the average stock count as unachievable. Deleveraging: WFC has increased the CET1 ratio, fully phased-in, to 10.7% from 10.4% at end-2014. Along with OCI losses, this is limiting the net payout ratio for FY2015 to <60% and it would have been lower had balance-sheet optimization not held RWA growth of 2% below loan growth of 7%. With optimization having run its course, the driver of capital-build shifts from deleveraging to RWA growth so that, again along with OCI losses and allowing for some preferred issuance, the net payout ratio will remain below 60%. Beyond non-conservative assumptions for operating and RWA leverage, the downside risk is on credit. Even assuming no meaningful deterioration in loss-performance and a reserve ratio at or about current levels, credit expenses increase ~50% in each of the next two years. The upside risk is on revenue but, with non-interest revenue unlikely to grow much more than 2%, consensus is already assuming a 10bps increase in net interest margin (from the GAAP level of 2.9% in 2015) in each of the next two years. This is achievable, even in the “lower-for-longer” rate environment envisaged by management, as the loan-to-deposit ratio rises (with deposit growth falling to 5% or less), but upside requires an earlier rate lift-off. Given negative EPS revisions, along with the ROA remaining at the low-end of management’s guidance range of 1.3-1.6% and no meaningful improvement in ROE from the current 13% towards the high-end of the 12-15% guidance range, we do not expect WFC to re-rate from the current 2.2x tangible book value of $23.5/share; this limits near-run upside to ~$5 being a couple of turns on the expected $2.3/share walk-forward increase in tangible book value through end-2016. We prefer C and BAC (see table below). 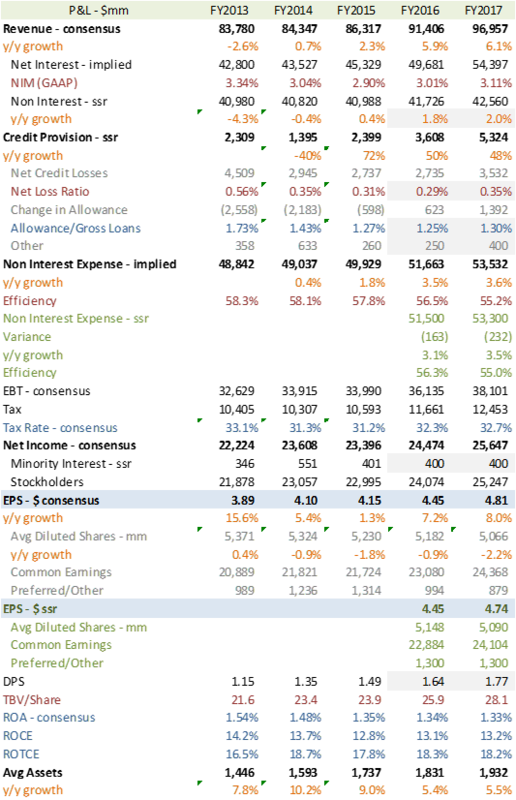 Consensus is calling for WFC to generate EPS growth of 7-8% in 2016 and 2017 on revenue growth of 6%. While the revenue is achievable even in a “lower-for-longer” rate environment envisaged by management, as a rising loan-to-deposit ratio lifts net interest margins and compensates for low growth in non-interest revenues, the implied operating and capital leverage look challenging. The reason is that, even with no meaningful deterioration in loss-experience, credit expenses will grow ~50% as the loan-loss allowance reverses from release-to-build in 2016 and then accumulates with continued loan growth in 2017. The result is a 2017 EPS-shortfall, albeit of only a nickel+ on consensus of $4.81 (see “EPS – $ SSR” in Exhibit 1), even if the efficiency ratio falls to the low-end of management’s guidance range of 55-59%. Given it currently stands at 58%, this would require significant operating leverage with expense growth held to 3.5% or below. Beyond lowballing preferred flows, consensus bridges the gap through capital leverage with average diluted shares falling over 2% in 2017. However, this requires a net payout ratio above the high-end of management’s guidance range of 50-65% along with increased leverage of the risk balance sheet (reducing the CET1 ratio, fully-phased, to 10.6% by end-2017 from 10.75% expected at end-2015). A key driver is increased growth in risk-weighted assets or RWA towards that of loan growth (forecast at 7%) from the 2% of 2015; the reason is that the scope limiting RWA growth through balance-sheet optimization has largely run its course. In assuming 6% growth in RWA we assume some ongoing optimization benefit but maintain the CET1 ratio at or about current levels. 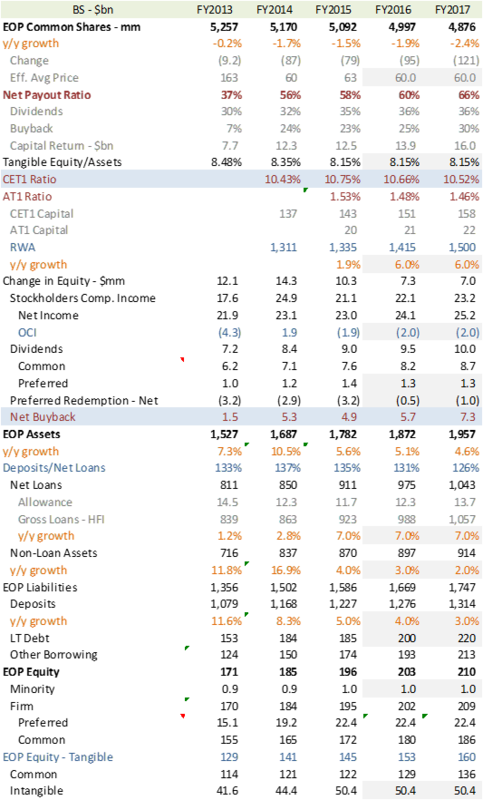 After allowing for OCI losses of $2bn along with some preferred issuance, these assumptions generate a net buyback in 2017 of just under $6bn reducing the end-of-period share count by 2% (see Exhibit 2) and the average share count by 1.1% versus consensus of 2.2%. In summary, we expect negative revisions of 2017 EPS, which have fallen from $5.10 a year ago to the current $4.81, to continue. Along with ROA remaining at the low-end of management’s guidance range of 1.3-1.6% and no improvement in ROE from the current 13% towards the high-end of management’s guidance range of 12-15%, we do not expect WFC to re-rate from the current 2.2x tangible book value of $23.5/share; this limits near-run upside to ~$5 being a couple of turns on the expected $2.3/share increase in tangible book value through end-2016. A feature of the earnings model at Wells Fargo is the use of the balance-sheet to stabilize reported results. For example, in the third quarter, there was a $2bn positive swing in other comprehensive income as the back-up in rates from the prior quarter reversed creating gains, rather than losses, in the securities portfolio. For context, this swing represents one-third of the $6bn net income for the quarter. And yet, the company delivered in-line results with a net payout ratio of 60%, right in the guidance lane of 55-65%. This was accomplished through harvesting securities gains which came in $400mm higher than the quarterly run-rate for the first-half. The effect is to suppress the payout ratio (since realized gains flow through the earnings denominator) and allow the firm to absorb energy-related losses both as negative marks of $54mm on energy-sector investments (accounted for as other-than-temporary-impairment or OTTI) and an unspecified increase in reserves for energy-sector loans. The securities gains create stiffer compares for non-interest revenue which we model as increasing at 2% in 2016 and 2017 (versus less than 0.5% in 2015). While card fees are growing nicely at 8-10% as WFC increases penetration of household accounts, they represent less than 10% of non-interest revenue (see Exhibit 3); over two-thirds of non-interest income, excluding trading and securities gains, is from three categories that, between them, we expect to limit growth: deposit service charges, trust and investment fees, and mortgage banking.